Compass crew members just got back to work from a fun weekend/night at Insomni’hack (Geneva) where hackers met  to solve puzzles and enjoying the hacker community. On the way back home was sufficient time to clean-up systems and to reflect on some of the challenges. There was a variety of brain teasing puzzles relating to application, network and computer security, digital forensics, reversing or steganography. During the contest the team gets more challenging puzzles unlocked by the time they hand in solutions. The solutions was always some sort of special formattet string a.k.a. token or nugget. I decided to write-up one of the puzzles to have it documented of course and to provide you with an idea how such a puzzles looks like. So, let’s dig into it. Interestingly, the number of beacons matches the number of characters required for submition to the nugget verification application of that hacking challenge and for some reason we also have a copy of a public key. Usually, for sufficiently large and properly chosen keys, the derivation of the private key from its public coutnerpart is not possible. In this case, the key size is obviously not that large and as we have no other information so far, let’s try to bluntly factorize the modulus N.
You could either try to do so online  or use CryptTool . The result clearly shows that an unfortunate combination of primes was chosen as the base of the key material. 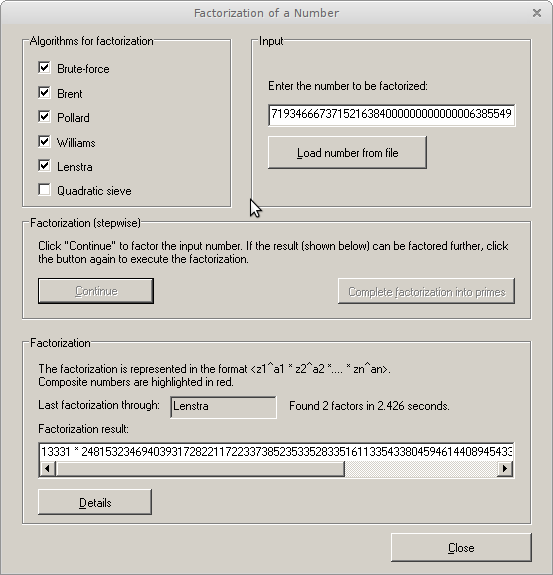 So let’s see whether we can calculate the RSA private key from the parameters we have already. Finally you will need to compute d = e^-1 mod phi(N) in order to get the private key. If your prefer to solve it in python it’s far more challenging. I have not been very successfull in finding a python RSA library that allows for that specific calculation. Luckily there are lot’s of websites actually providing hints on how to calculate the modular inverse based on the extended euclidean algorithm. Thus I went for a copycat approach . In python this is pow(beacon,d,n) rather than (beacon**d) mod n. Mathematically, both python statements should return the same result. However, pow is optimized to handle large factors whereas (beacon**d) mod n will take forever for RSA like calculations. Finally, we get ASCII characters from each beacon which turned out to be the correct format and plaintext to qualify for a solution (python script – calculation.py). Thanks to the SCRT team who actually built not only this but also other fun and challenging puzzles and thanks to those who were sufficiently patient to discuss twist and turns while battling! For those interested in solving puzzles and hands-on security training join us for our awsome courses or sign-up for a free remote hacking-lab.com  account and get knee deep into our virtual pwnable lab. Hacking-lab features a wide variety of information security, penetration testing, security assessment and forensics hands-on training exercises to educate students and information security professionals. Give it a try. Nice write-up. Just for reference – if you’re already using CrypTool anyway, you could also use it to calculate d from p,q,e without having to code anything on your own: Indiv. Procedures > RSA Cryptosystem > RSA Demonstration. That’s how I solved it during the competition. Thanks for the hint. I just redacted the post to include your comment.